Most of us have appeared in group photographs--at school, work, banquets, weddings, and any number of other human gatherings. They can reflect accomplishment or mourning, joy or simply organization. We keep them as records of our place and history in the world. My own favorite place is with my grandfather, seated and holding his cornet, in an 1890s photo of an orchestra of 30 formally dressed men in upstate New York. Muslim Women Bowing, New York City, 2014. His most recent photographs in the exhibition, made during the last six years, are part of “The Prayer Project,” in which he records Hindu, Pentecostal, Voodoo, Muslim, Jewish, Buddhist, Hari Krishna and Inter-Faith gatherings, all in New York City, along with a Meditation on Death in a Brooklyn park. The level of engagement is quite extraordinary, as it is in all Slavin’s work, with human shapes and mélanges of color and movement filling the rectangles with life. It seems almost possible to hear the gathering of voices. Muslim Women Bowing, New York City, 2014. 44 1⁄2 x 17 3⁄4 inch digital chromogenic print. These latter-day expressions of spiritual involvement are not repudiations of the multiple worlds engaged in Slavin’s earlier work—the worlds of national parks, public transportation, the Stock Exchange, cemeteries, zoos, burlesque shows, and myriad others. In one way or another they are part of the world in which humankind has existed in recent times—to be honored as such, and well beyond what any one person is able to experience. The irony, of course, is that we all live in a world, and a universe, that we know very little about. There is constantly more to know, and more that we will never know. Staten Island Ferry Crew, New York City, 1973. For Slavin, as for all of us, his journey of discovery began in childhood. But it uniquely intensified with his development as a photographer, particularly from 1972 on, when he began to use color film almost exclusively, realizing that color provides much more information than black-and-white. 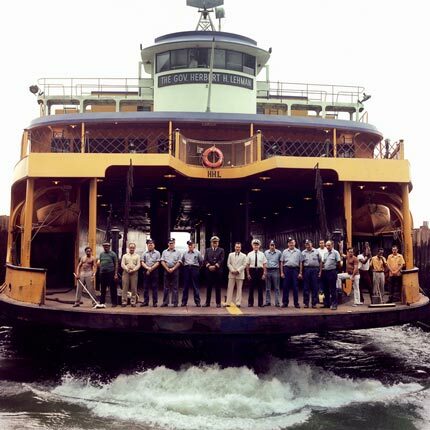 One of the early photos in the show, from 1973, Staten Island Ferry Crew, views one end of the Governor Herbert H. Lehman ferry, the crew standing across the bow, as the boat pulls away from the pier. In a way, this represents the beginning of Slavin’s journey into the world, into the harbor that has embraced so much of the world. 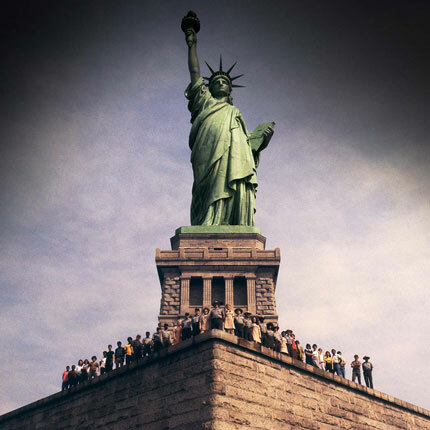 In the middle of the harbor is the Statue of Liberty, the great monument to that embrace, which Slavin also photographed in 1973. He views members of the Liberty Island staff standing along the reverse perspective of the monumental base wall, behind which rises the lady with the torch into a magnificent white cloud in a deep blue sky. Staff of Statue of Liberty, Liberty Island, NY, 1973. There are probably more photographs of the Statue of Liberty than any other subject in the world. It is a cliché, I suppose, but maybe more like an old, irresistible, wise saying. For Slavin, it is part of his burgeoning exploration of the world at the time, everything from subway workers at Coney Island Station, to Sabrett hot dog vendors, to the Troc Burlesque Theatre in Philadelphia, to workers among the graves of Ridgewood Cemetery in Queens, to an awe-inspiring view of the Grand Canyon with its National Park staff line up along the great cliff. 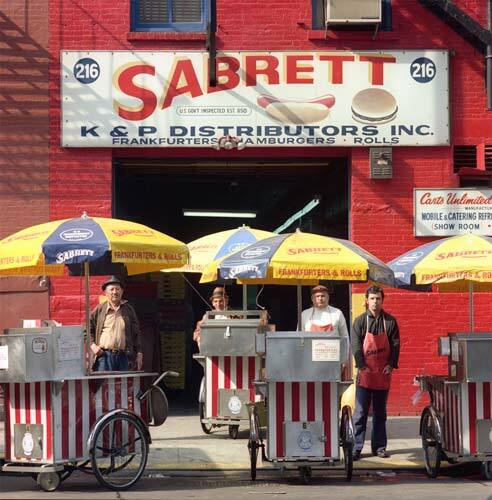 Sabrett Hot Dog Vendors, New York City, 1974. 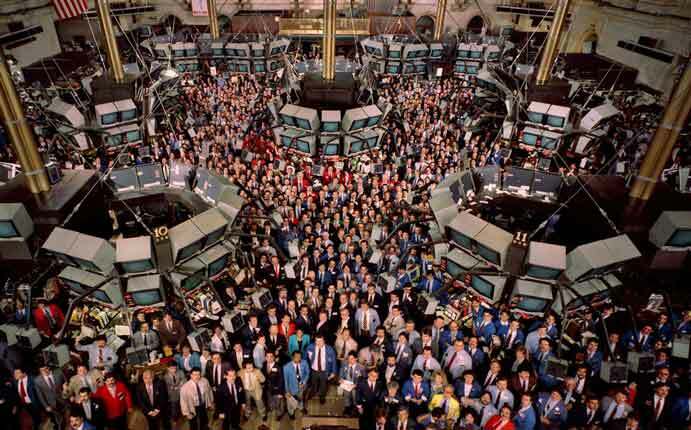 New York Stock Exchange, 1986. From this time on Slavin insistently enjoined the theatrical, spatial, and dimensional traditions of western European and American painting since the Renaissance. Subjects involving a great conglomeration of people, as in New York Stock Exchange of 1986, bring to mind the frenetic comings and goings of peasants and townspeople in paintings by Pieter Brueghel the Elder and Hieronymous Bosch in the 16th century. The largesse and precision of structural space in Staff of New York Public Library echoes Paolo Veronese’s grand Banquet at the Marriage of Cana by Paolo Veronese (also 16th century). And Editorial Staff of the New York Times Magazine might recall Renoir’s Luncheon of the Boating Party of 1881. Photography is, in a sense, a technological continuation in the history of spatial perception that began with the emergence of one-point perspective in early 15th- century Italy. Everything within the line of sight of the camera lens (the eye of the photographer) is available to be included in that structure, and so an enormous sensibility can be involved in resolving the collusion of elements. It is the nature of Slavin’s work to accomplish both structure and multiplicity, what the world eternally affords us. 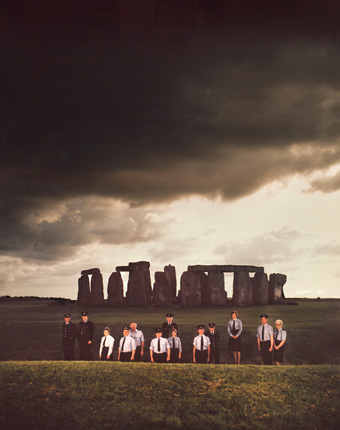 Our lives are shadowed by everything and everyone around us, as the custodial staff lined up horizontally in front of the ancient monument of Stonehenge is shadowed by the great stones behind them and the dark clouds above. Custodial Staff, Stonehenge Ancient Monument, Amesbury, Wiltshire, UK, 1974. A photograph of Slavin’s not in the show expresses the extent to which he understands we are alone, or at least within ourselves, as much as being so much part of the world around us. The eye of a young woman, manakin or not, peers out through a small hole ripped in a white sheet of plastic that has been placed over her head to protect her from the rain. This is the shadow, the otherness that stays with us, and what the photographer returns to look into. All other material © Copyright 2018 New York Art World ®. All Rights Reserved.